Two-time Grammy-winning American violinist Hilary Hahn and Genero invite you to create a short film for a selection from her latest album, "In 27 Pieces: the Hilary Hahn Encores." The work, entitled "133... At Least. ", is by Emmy and Grammy Award-winning composer James Newton Howard. 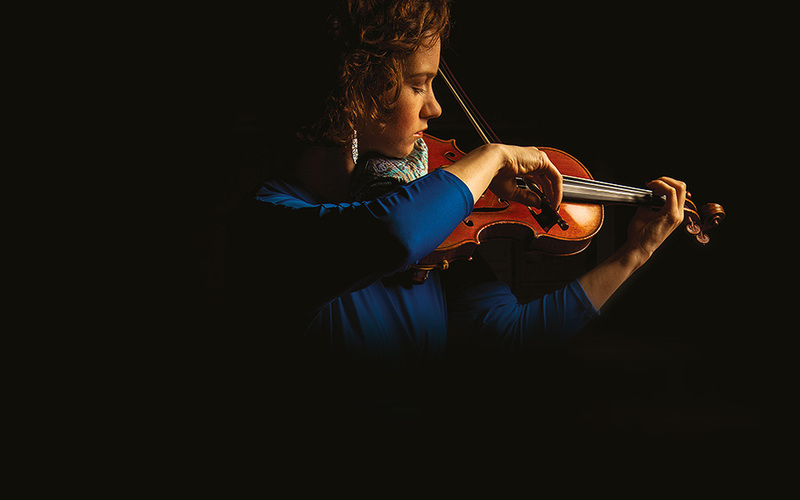 More than ten years ago, Hahn began thinking about "In 27 Pieces: the Hilary Hahn Encores": an ambitious project to expand and enrich the violin repertoire. She commissioned more than two dozen composers to write short-form pieces for acoustic violin and piano and has toured these new works internationally over the past two years. The recording recently debuted at #1 on the Billboard classical traditional chart. The direction for this video is left completely open to you – listen to the track and get creative! The final winner will be chosen by the fans and announced on January 20, 2014. Deadline for submissions is January 9, 2014, 23:59 GMT time. The winner will receive $4,000 and have their video used as an official music video for 133... At Least. Outstanding videos will also be nominated for the 2013 Genero Awards and in the running for $50,000 in awards. Hilary will select her top submissions and ask fans to vote on the best one to determine the official video. The 2013-14 season marks the 30th anniversary of Hahn’s first violin lesson. In the two decades since her professional debut, Hahn has followed her passion for adventurous programming, delving into core repertoire, contemporary music, and less familiar classic compositions with equal commitment; and bringing virtuosity, expansive interpretations, and daring repertoire choices to diverse global audiences. This season, she revisits pieces by Mozart, Vaughan Williams, Sibelius, Brahms, Barrett, García Abril, and Vieuxtemps, while expanding her repertoire with works by Bruch, Schoenberg, Nielsen, Schubert, Telemann, and Rautavaara. Between September and June, Hahn will give performances in nearly 50 cities in 14 countries throughout North America, Europe, and Asia. She will join the Camerata Salzburg, the Chamber Orchestra of Europe, the Frankfurt Radio Symphony Orchestra, and the City of Birmingham Symphony Orchestra on tour, and make guest appearances with such ensembles as the Los Angeles and Berlin philharmonics and the Detroit, Atlanta, Indianapolis, New Jersey, and New World symphony orchestras. In spring 2014, Hahn will dedicate two months of the season to her ongoing recital collaboration with pianist Cory Smythe. Read more. PLEASE NOTE: Once this Project is announced, all Videos will be moved to Genero's YouTube player, and then embedded on Genero. They will not be streamed from Genero's own player. The 2013-14 season marks the 30th anniversary of Hahn’s first violin lesson. In the two decades since her professional debut, Hahn has followed her passion for adventurous programming, delving into core repertoire, contemporary music, and less familiar classic compositions with equal commitment; and bringing virtuosity, expansive interpretations, and daring repertoire choices to diverse global audiences. This season, she revisits pieces by Mozart, Vaughan Williams, Sibelius, Brahms, Barrett, García Abril, and Vieuxtemps, while expanding her repertoire with works by Bruch, Schoenberg, Nielsen, Schubert, Telemann, and Rautavaara. Between September and June, Hahn will give performances in nearly 50 cities in 14 countries throughout North America, Europe, and Asia. She will join the Camerata Salzburg, the Chamber Orchestra of Europe, the Frankfurt Radio Symphony Orchestra, and the City of Birmingham Symphony Orchestra on tour, and make guest appearances with such ensembles as the Los Angeles and Berlin philharmonics and the Detroit, Atlanta, Indianapolis, New Jersey, and New World symphony orchestras. In spring 2014, Hahn will dedicate two months of the season to her ongoing recital collaboration with pianist Cory Smythe. Hahn took her first lessons in the Suzuki program shortly before her fourth birthday. When she was five years old, she met Odessa native Klara Berkovich, with whom she studied until being admitted to the Curtis Institute of Music at the age of ten. There, Hahn was a pupil of Jascha Brodsky, who had trained with both the Franco-Belgian master Eugene Ysaÿe and the Russian pedagogue Efrem Zimbalist. She completed her university requirements at Curtis at 16, having already made her solo debuts with the Baltimore and Pittsburgh symphony orchestras, the Philadelphia and Cleveland orchestras, and the New York Philharmonic. Hahn delayed graduation a few years in order to take further courses in languages, literature, and writing. By the time she received her Bachelor’s Degree at 19, she was a full-time touring musician. Hahn’s ever-evolving approach to music-making and her curiosity about the world have made her a fan favorite. At the age of 16, Hahn embarked on her recording career. She has released 14 albums on the Deutsche Grammophon and Sony labels, in addition to three DVDs, an Oscar-nominated movie soundtrack, an award-winning recording for children, and various compilations. Encompassing a range of repertoire including Bach, Stravinsky, Elgar, Beethoven, Vaughan Williams, Mozart, Schoenberg, Paganini, Spohr, Barber, Bernstein, Ives, Higdon, Tchaikovsky, and many others, her recordings have received every critical prize in the international press and have met with equal popular success. All have debuted in the top ten of the Billboard classical chart. Her distinct approach to music shows a remarkable ability to honor the traditional violin literature while expanding listeners’ horizons. A recording pairing the Schoenberg and Sibelius concerti spent 23 weeks on the Billboard classical chart and also earned Hahn her second Grammy: the 2009 Award for Best Instrumental Soloist Performance with Orchestra. Her first Grammy win came in 2003 for her Brahms and Stravinsky concerto album. In 2010, she released Jennifer Higdon’s Violin Concerto along with the Tchaikovsky concerto. Higdon’s piece, written for Hilary Hahn, went on to win the Pulitzer Prize. In 2011 Hahn recorded Charles Ives: Four Sonatas, bringing her lyrical sensibilities to the chamber music of one of America's most innovative artists. Her most recent album, Silfra, captured her collaboration with experimental prepared-pianist Hauschka. The record was produced by Valgeir Sigurðson and was entirely improvised by the two performers after an intensive period of preparation. The 2013-14 season sees the release of Hahn’s long-awaited album, In 27 Pieces: the Hilary Hahn Encores, with pianist Cory Smythe. This recording is the culmination of a multi-year project to renew the encore genre. Hahn commissioned 26 composers from around the world to write short-form works. For the 27th encore, she held an open contest that drew more than 400 entries. The international premiere tours, from 2011 to 2013, were met with wide critical and audience acclaim. Hahn's gregarious personality reaches out to students, new listeners, and anyone with an interest in music and the arts. She is an avid writer and interviewer, posting journal entries and articles on her website, hilaryhahn.com. Additionally, she produces a YouTube channel, youtube.com/hilaryhahnvideos. Elsewhere, her violin case comments on life as a traveling companion, on Twitter and Instagram at @violincase. She has appeared on the covers of most major classical music publications and has been featured in mainstream periodicals such as Vogue, Elle, Town & Country, and Marie Claire. In 2001, Hahn was named “America’s Best Young Classical Musician” by Time magazine. In January 2010 she appeared as guest artist, playing Bartók and Brahms, on The Tonight Show with Conan O’Brien. Hahn has participated in a number of non-classical musical productions, appearing in two records by the alt-rock band …And You Will Know Us By The Trail of Dead; on the album Grand Forks by Tom Brosseau; and on tour with folk-rock singer-songwriter Josh Ritter. The greatest run of two rabbits.